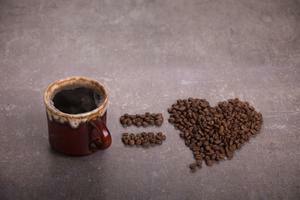 There is little doubt that people all over the world love their coffee. We have learned many ways to brew and flavor our coveted drink. But have you considered candy? If you haven’t, you have chosen the perfect time of the year to give it a try. Below we will share with you some of our favorite coffee/candy recipes. But, before you begin on this sweet journey be prepared to fall in love with the various candy treats you will try for yourself. You can purchase rainbow candy, chocolates, caramels, and much more online. Use your creativity and be willing to try new flavors. Who knows, you might invent the next new coffee trend. 1 cup of your favorite freshly brewed coffee ( Note: the candy additions will make your coffee sweet. If you like a less sweet drink, brew a dark and rich coffee). Start by brewing a batch of your favorite roast coffee. Top with whipped cream and add a peppermint stick for garnish. If milk chocolate syrup is too sweet, try melting dark chocolate chips as you did peppermint. For a caffeinated brew with a spicy kick, try this recipe that includes cinnamon and hot chocolate mix. It will instantly wake up your guests and get them in the mood for the holidays. Heat half a small bag of peppermint chips in a saucepan and stir continuously until it turns into a liquid. Pour the mixture into the pot of coffee and add chocolate syrup as desired. Stir, and pour into individual mugs. Top with whipped cream and add a peppermint stick for garnish. Variations: You may omit the peppermint syrup by adding a peppermint stick to stir the coffee. 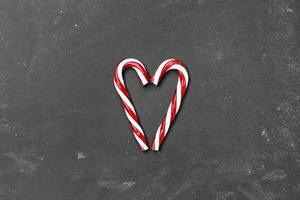 You may also break peppermint candy into small pieces and sprinkle over the melting marshmallows. Brew your favorite coffee and pour it in a large mug. Be careful not to fill it more than ¾ full. Add sugar and cream to taste and mix it well. Drop in ice and stir. Top your iced coffee with lots of whipped cream. Drizzle melted chocolate and melted caramel around the edges of the coffee and decorate by drawing lines of white chocolate across the whipped cream. Sprinkle with chopped pecans. 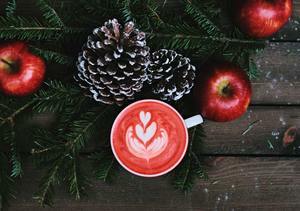 Sometimes we want a festive treat for our coffee when we are at work or away from home. The answer is peppermint & chocolate spoons to stir your coffee. Melt your milk chocolate in a microwave for 15 seconds at a time, stirring between cycles until the chocolate is smooth. Dip your peppermint sticks in the chocolate and place them on the wax paper. Now melt your white chocolate in the same manner in the microwave. Pour the melted white chocolate in a sandwich bag filling the corner. Twist until tight and then snip off the corner with scissors. Drizzle the white chocolate over the milk chocolate. You may add sprinkles. When the peppermint sticks are cool, wrap them in plastic to give as gifts. Use these sticks to stir your coffee. The chocolate will melt first making your coffee creamy. Then the peppermint will slowly melt as you sip your coffee. You can use these to stir hot chocolate too. Your hot chocolate will be more creamy and tasty than it ever was before. Do not limit yourself to recipes you find in cookbooks and online. There are many candies that taste great in coffee. Try butterscotch and whipped cream. Try dropping crushed cinnamon candy and pumpkin spice into your coffee. Candy makers have long mixed sugars, syrups, and spices to make new candies. You should be as bold. Just use your imagination and create wonderful sweet and rich brews. You will be amazed at what you can come up with. Be sure to write down the ingredients and portion sizes. When you find the right flavor, you will have your recipe recorded. Who knows? You could end up writing the next holiday coffee cookbook.